Some articles on Diary of the Evans-Crittens, www.evans-crittens.com may contain affiliate links. Click here to read my disclosure policy. We used to take the kids to the Torch Theatre Pantomime every Christmas (apart from the year I had to miss due to giving birth to our youngest, Isabelle). Now the kids are older they watch the panto with school, so I stopped buying tickets as they wouldn’t want to watch the pantomime twice, would they? Well it turns out I was wrong and after watching the show with school the kids couldn’t stop talking about it and asking to see the show again! So, off we went on Saturday to watch the first public showing of Peter Doran’s Sleeping Beauty. For Christmas 2016, The Torch Theatre Company will perform a spellbinding new production of Sleeping Beauty. Filled with jealousy, the evil witch Maleficent curses Princess Rose to die on her 16th birthday but thanks to Rose’s Fairy Godmother she only falls into a deep sleep that can be ended with the kiss of a handsome prince. The show opens to familiar characters in this well known fairy tale. 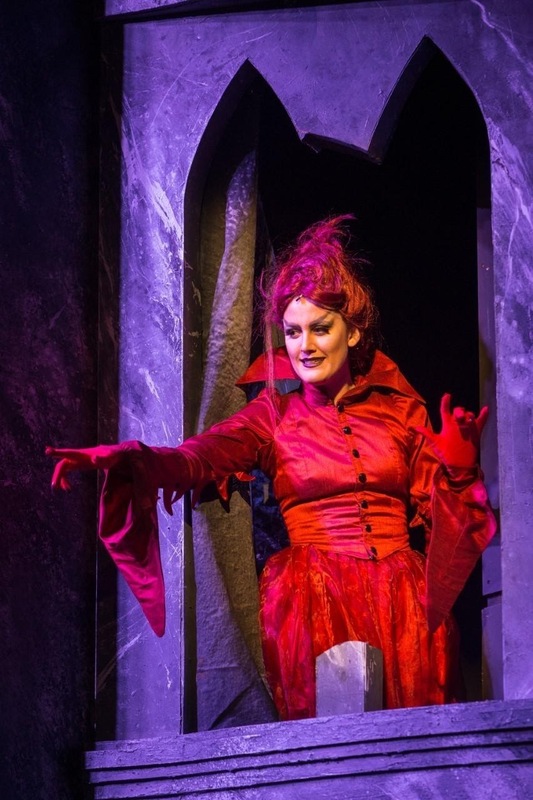 During the Christening opening scene, the audience are immediately drawn in, booing the evil Maleficent (played by a wickedly good Francesca Goodridge) as she places a curse on the baby (Briar) Rose (portrayed in an extremely clever and funny part actress/part puppet way!). We cheer when the wonderful Fairy Godmother (Cler Stephens) sets the scene, narrates the story and saves the day- for now. 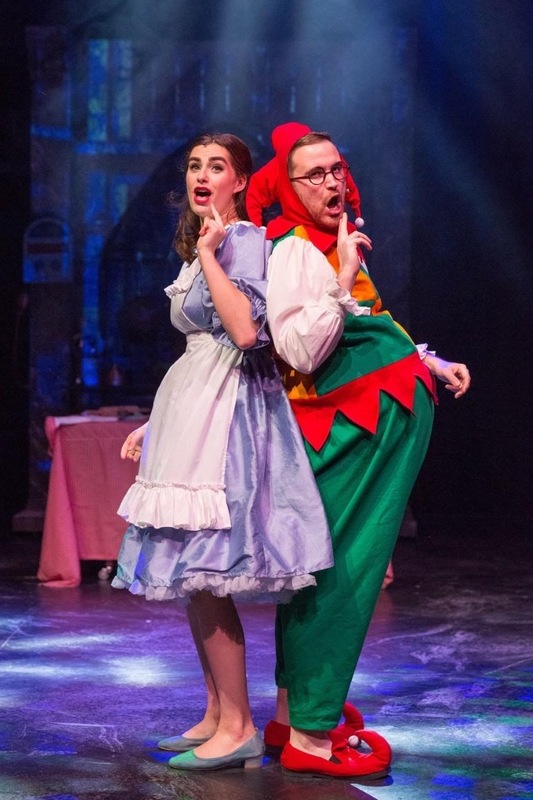 For me, the show really started with the entrance of Fanny the Nanny (Bing the King (Gareth Wyn Griffiths) is a fan of rhyming couplets resulting in hilarious word play) to Aerosmith’s “Dude Look Like a Lady“. There really is nothing like a (pantomime) Dame! 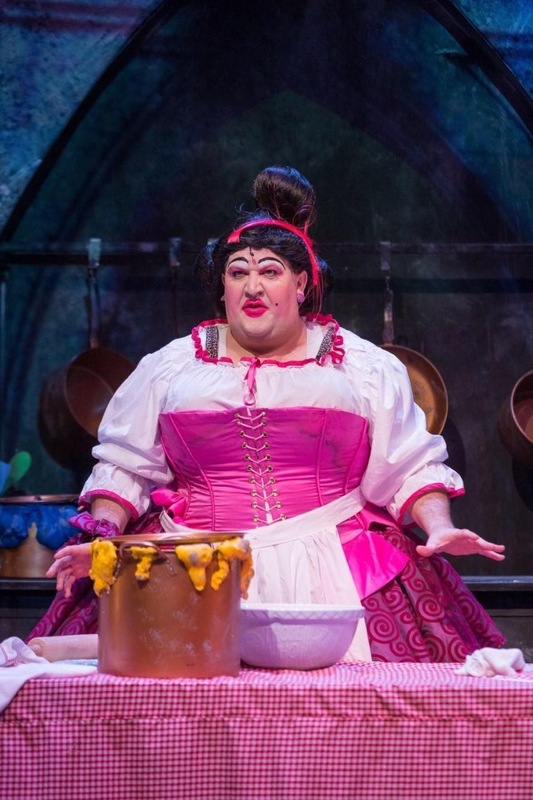 Dion Davies returns as the much loved Dame and gives us lots of laughs along with his partner in comedy, the lovable Fester the Jester (Sion Ifans). As in true panto style local places are mentioned, there are shout outs (remember to let the Torch know if you’re in a large group or it is someone’s birthday) and Fanny takes a fancy to the “Hunka-Chunkas” in the audience (which was even more amusing to my girls when it was their own teacher!). Rose (played by Miriam O’Brien ) wins the audience over by portraying a strong, independent princess and inviting us to her birthday party. After recently playing the infamous silent role of the Woman in Black, it’s great to see (or should that be hear) O’Brien get the chance to demonstrate her strong, beautiful singing voice. One of my favourite songs was a touching love song, “I think I’m in love” with the added “Or, it might be flu” which made us all laugh out loud. Sleeping Beauty’s love interest is Tuppa the washer upper (Joseph Robinson) who we know to really be Prince Roberto whom Rose assumes would be a drip. Thankfully, meeting each other in the Castle Kitchen they fall in love with each other for who they really are and not for their social status or money (Roberto’s “loaded” as King Bing often reminds us!). Sean Crowley’s cleverly designed set is stunningly effective with a Medieval castle with towers which are put to great use, a Castle Kitchen and a staircase and upstairs castle rooms. Most impressive is the fight scene between Maleficent, a fire breathing Dragon and Prince Roberto, which makes use of projected images, atmospheric smoke and lighting (Ceri James). The rest of the cast come out into the audience and encourage us to cheer Roberto on, giving the young audience a sense of achievement when we have together defeated the dragon and therefore Maleficent. The original score, composed by James Williams, is catchy and encouraging to toe tap and clap along to and could only have been improved by a singalong with Fanny Nanny and Fester Jester during the show. As it’s Christmas, there is a happy ending to the Pantomime and Maleficent is forgiven- with a hilarious twist which I will save as a surprise, but the kids are still talking about it! By the end we were up on our feet, joining in with a song and a dance with the strong, talented cast. 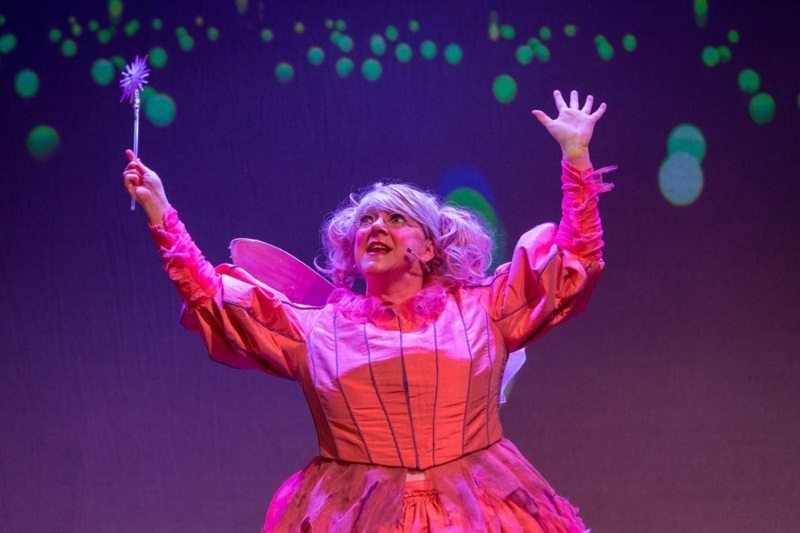 Panto is for families and Doran has wrote a show suitable for all ages- there is plenty of toilet humour and snot jokes and also more sophisticated innuendo. There is even a cameo from the TARDIS (how else are Fairy Godmother’s expected to time travel these days?). 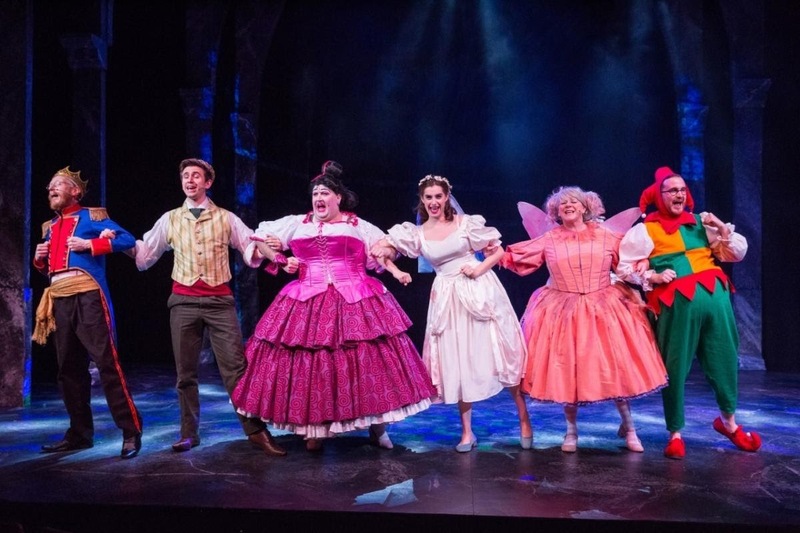 We give Sleeping Beauty at the Torch Theatre a great thumbs up and recommend that you go to see it (even if you’ve already seen the show before!). Sleeping Beauty runs until December 31st. Tickets: £17.50, £15.50 and £15.00 (TLC), family tickets £55. Have you been to see Sleeping Beauty or your own local Pantomime yet? We were given tickets for the purpose of this review.